Vite fans: welcome to the Vite Biweekly Report (November 15–30, 2018). Let’s see what happened to Vite in the past two weeks! We welcome a new advisor to the team: Michael Gasiorek, Founding Partner of Truth Cartel, a marketing agency responsible for the creative distribution of emerging technologies and blockchain projects. 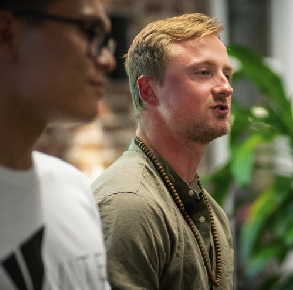 Michael was the Editor-in-Chief of Startup Grind and currently serves as Co-Director of Startup Grind SF and OneSalon communities. He has just joined the Vite Silicon Valley team, playing a key role in social media management and community building. The Android wallet is in development. We have ensured functionality of the mobile library, encryption algorithm, login and mnemonic recovery. Iteration seen in iOS wallet 1.1.0 and 1.2.0, the optimized process facilitates the choice of 12 and 24 words mnemonics, transaction type listing, and fast address copying. Web Wallet 1.2.0 version has been updated providing support for 12 and 24 words mnemonics, transaction types as well as other refactoring and optimization features. Block Explorer 1.1.0 development has been completed. In the new SBP info page, node rewards can now be viewed. The vitejs SDK is refactored. Serving as the front-end base library, vitejs can facilitate third-party front-end support for Vite functions. The code will soon become open source. Go-vite full-node debug: ledger download speed and API optimization. Go-vite full node monitoring design completed. 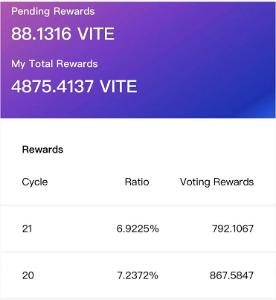 The go-vite official SBP voting reward service development completed; this includes voting calculations, reward calculations, and rewards distribution. On November 23 at noon, the award was officially calculated. On November 23, users who voted for official super nodes had their rewards calculated. The reward calculation period takes place for 24 hours, and a settlement will be made every day at 4:13:14 am PST (12:13:14 pm in China). Anyone who votes for an official SBP will participate in the 8,000+VITE reward pool every day. On November 22, we posted a tutorial on “How to Use the Smart Contract to Transfer Tokens Through MetaMask”. Users can follow the steps on how to transfer ERC20 VITE tokens to the Vite TestNet. On November 23, a second method of using a smart contract to transfer ERC 20 tokens was released (this provides a simpler understanding of previous instructions given). In order to save Vite users time, our team plans to open up an artificial transfer channel. If the amount of Vite tokens you wish to migrate exceeds 10,000, you may contact someone from the official team to assist you with token migration. Since the TestNet has gone live, we have received lots of support from our users. The amount of tokens migrated exceeded 50 million VITE within a 5 day timespan. On November 21, our US team posted a Vite-related quiz on Medium that was comprised of 12 questions, each participant had the opportunity to use the TestNet comment feature to answer questions and win 6,000 VCP. On November 22, we released a fun Thanksgiving campaign on Twitter, asking people to identify the differences between two team images with the presented opportunity to win 70,000 VCP. From November 28, we started a signature collection campaign on Bitcointalk. Participants can design signatures on Bitcointalk to earn rewards. Please refer to this link for further details: https://t.co/f2ZcIEJ7ko. On November 28, Vite Labs COO Richard attended the FinTech on the Block Conference in San Francisco. He moderated a panel discussing topics of identity protection, zero knowledge proofs, and new scalability solutions. Q: What is the difference between staking VITE and running PoW? A: There are no fees for transactions on the Vite network, but a quota is required. The low-frequency users can obtain the quota by running a PoW. When high-frequency users run the PoW and cannot meet the requirement needed for the transaction, staking VITE can be used to obtain the quota. Q: When attempting to download the iOS wallet, why will the link not open? A: If you use WeChat, it will not re-direct you automatically. You will simply need to type the address in your browser: https://app.vite.net. You can only use the wallet with iOS10 or any later version. Q: When the proportions of the vote increases, why do the rewards became less? A: Newly registered SBPs take away some of the rewards, which means that the total reward amount will decrease. Although the proportion of votes increased, the amount of VITE obtained has likely decreased. Q: Why was no reward received after voting? A: Only voting for an official super node will guarantee that you receive rewards. The five official super nodes are integrated, and you will be able to vote for any of them. The five official Vite super nodes are: Vite_SBP01, Vite_SBP02, Vite_SBP03, Vite_SBP04, Vite_SBP05. Note: Staking VITE is a separate function and does not constitute participation in the voting process. Q: How do you transfer ERC20 tokens to the TestNet? If the number of tokens you wish to migrate exceeds 10,000 VITE, you may provide your Vite account address and privately chat with a “Vite Official Secretary” (WeChat username: mei-mei-ha) to assist with token migration. @Tony_Vite great update. Keep up the transparency guys.